In the past several weeks, you have been following our series, “Fall Pest Guide”. This series has expounded on the most common pests during the fall months. These include spiders, mice, stink bugs, crickets, and box elder beetles. This week, in the final installment of our fall pest series, you will learn about Asian ladybugs. While these insects are particularly appealing, they often end up becoming a nuisance once autumn arrives. This is because it is at this time of the year when the bugs will fly into various types of structures in order to discover a safe haven during the winter months. Once the Asian ladybug enters into a structure, they will crawl on various interior surfaces and emit a highly-noxious odor. In addition to this, they are known to leave behind a yellow fluid that stains on the areas where they crawl. During the fall months, it is not at all uncommon for Asian ladybugs to detrimentally impact the quality of life for those whose homes and other buildings are invaded. The adult Asian lady bug is oval-shaped and about a fourth of an inch long. Their colorings are known to vary. Many are tan, some are orange, and then, there are those that are red. 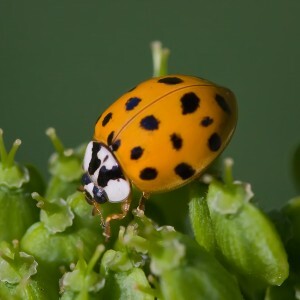 It is common to find that the lady bugs have black-colored spots on the covers of their wings; however, it is not considered to be uncommon for no spots to be present on the body of the lady bugs. There is often a white-colored location immediately behind the head. In most instances, this area will have a shaped marking that resembles either a “W” or an “M”. Asian ladybugs are mainly an insect that dwells in trees, in orchards, and in forests. In various regions of the world, the insects may reside in soybean fields, ornamental crops, agricultural crops, and tobacco fields. The Asian ladybugs do not have a vast array of natural enemies, but, wasps and flies have been known to parasite the insects. When these insects are disturbed, they are known to emit a foul-smelling odor for defense purposes. In most cases, the cold temperatures during the winter months will kill the Asian ladybugs. This is why, during the fall months, the insects will attempt to locate shelter.